Dr. Peter Diamandis has for over two decades been one of the most active of space activists and one of the most successful. While attending MIT in 1980 he founded the Students for the Exploration and Development of Space, (SEDS), which has since grown into a worldwide organization. In 1987 he co-founded the International Space University (ISU), which offers graduate level courses at its campus in Strasbourg France. He has also co-founded two notable space related businesses. Space Adventures offers various space related adventure tourism packages and the company helped to arrange the flights of Dennis Tito and Mark Shuttleworth to the Space Station. Zero Gravity Corporation (ZERO-G) formed in the US last year to offer offer weightlessness experiences on an airplane flying parabolic trajectories. In this interview, however, I concentrated on one of his most innovative and potentially most influential projects: the X PRIZE. Ten million dollars and a beautiful trophy will go to the first non-governmental team that: "finances, builds & launches a spaceship, able to carry three people to 100 kilometers"; returns safely to the earth; and then repeats the feat again within two weeks. The goal is to encourage the private development of low cost space transportation in an step-by-step approach, starting with an easier target than reaching orbit. The competition is patterned after the aviation prizes of the 1920s and 1930s that contributed so significantly to the development of aviation. Since the non-profit X PRIZE foundation started in the mid-1990s the momentum of the project has steadily grown and recently accelerated. Full funding of the $10 million prize money was attained last year and it must be awarded by January 2005. Twenty-four teams have registered for the contest and several indicate that test flights will begin this year. Dr. Diamandis kindly agree to answer some questions that I sent him concerning the project's latest developments, the challenges of creating such a contest, and how the X PRIZE could put us on a path to low cost access to space . HS: The X PRIZE race is getting serious. It really looks like several competitors will be doing test flights this year and flights for the money next year. Has the time that it has taken for teams to develop vehicles been longer or shorter than you originally expected? Diamandis: When we kicked off the X PRIZE in 1996, we expected that launches would take place sometime between 2002 - 2004. So, the timeframe stayed within my expectations. As with anything new, it took time for the X PRIZE to catch on, and also time for the teams to become serious and raise their own funds. We are really expecting a winner within the next 12 - 18 months. I wouldn't be surprised if a team or two attempted launches on or near the December 17th 2003 Centennial of powered flight. HS: Are you surprised by the large number of groups that have signed up? ? Diamandis: I am not surprised by the large number of teams who wish to compete. The world is full of innovative, creative people who also dream of going into space. The winner of the X PRIZE will be known as the Charles Lindbergh of the 21st century as the person who brought spaceflight to everyone. I think that the current X PRIZE teams represent only a small fraction of the groups who could actually develop suborbital spacecraft if the funding for such developments were more easily available. HS: I notice that the contest description on the website still makes a distinction between guidelines and rules and emphasizes that the list is "not a final set of rules." Was this intended to maintain flexibility so that no potentially viable approach was ruled out unintentionally? Diamandis: The use of two terms is a carry over from the start of the competition. We used the terms Guidelines in the beginning before we had our financial sponsors in place. We wanted to leave the door open so that someone putting up the money might want to modify the rules. This hasn't happened. The Rules are now finalized. HS: While several of the designs involve straight forward single stage approaches, others seem rather complex, e.g. balloon platforms, multi-stage vehicles, drop-off solid rocket motor boosters, water landings, etc. I understand, of course, that the teams should go for whatever design they think they can build and that can win the contest. However, these operational complexities make it more difficult to reach the project's goal of "economical vehicle reusability." at this point just to get something that flies to the 100km as a proof-of-principle? Diamandis: As mentioned before, the X PRIZE does not want to stifle decisions with respect to innovative and non-traditional designs. We do not want to rule out non-traditional designs as that may run the risk of missing an opportunity for innovation. Designs that appear to be outside of the spirit of the X PRIZE mission of promoting space tourism are discussed between the individual team and the X PRIZE on a case by case basis. We keep in mind that while Lindbergh's Ryan aircraft won the Orteig Prize, that vehicle was never used for transatlantic service. Our major goal is to create a significant public paradigm shift about how we all perceive spaceflight. We want the public to know that it will be available to all of us. HS: From looking at the current entrants, how far are we from vehicles that will achieve the goal of "low-cost [sub-orbital] spaceships for travel, tourism and commerce." While cost thresholds are a matter of personal perception, I believe that we will see frequent, regular, low-cost space travel within five years. I can imagine that the X PRIZE will generate three to four viable operating vehicles within the next two years, and then the process of making these vehicles more robust, as well as compliant with regulatory objectives (e.g. FAA regulations), could take an additional three years. HS: As I understand it, much of the prize funding will disappear if no one wins the competition by January 1, 2005. While not exactly a deadline - the trophy and whatever is in the pot could still be awarded later I assume - it will effectively act like one. I expect there will be a winner by that date but I also remember the Space Frontier Foundation's CATS competition. It looked like several teams were going to beat that deadline as well but all fell short. The X PRIZE originally did not involve a deadline. Would you have preferred to avoid a deadline? Or do you think that since viable teams have now formed, a deadline is a good way to concentrate their minds and light a fire under them, so to speak? Diamandis: You are correct in your observations. First of all, I am confident about the ability of a team to win by January 2005. The Trophy will be available beyond that point. The addition of the deadline was a result of our funding, and also the realization that a deadline helps focus the competition and bring about the result at an earlier point. We will always have the option to extend the deadline if necessary and if we are able. The Orteig Prize, for example also had a deadline of 1925 which was later extended and won by Lindbergh in 1927. HS: I suppose there are details of the funding arrangement with the insurance company that you don't want to get into, but perhaps you can discuss it in general. Am I wrong to say that basically it is a bet? That is, part of the money previously raised is being wagered on there being a winner before Jan.1, 2005? If there is no winner by that date, what percentage of the funding disappears? Diamandis: The X PRIZE is fully funded through January 1, 2005, through private donations and backed by an insurance policy to guarantee that the $10 million is in place on the day that the prize is won. The X PRIZE Foundation is a non-profit organization and is working to raise funds to support the X PRIZE competition events and as well as future competitions. Because we rely on private donations, it is not possible to predict our financial position two years from now. If any of your readers want to make a contribution or volunteer with our organization, we would be pleased to have their support. They can do this by calling our offices at 636-519-9449 or through our website at www.xprize.org . We are a public non-profit organization and welcome the participation of the public. That's what it is all about. HS: I've heard space entrepreneurs talk about a "brother-in-law effect". They would make a presentation to a potential investor who responded with great enthusiasm and a promise to soon make a contribution. However, a few days later, after hearing nothing, they would contact the investor who responded that he or she was no longer interested because a brother-in-law who works at NASA said that what they were doing was all crap! I thought of this when I read about the insurance arrangement. I imagined that the insurance company contacted various people, maybe even a brother-in-law or two : - ) , at NASA and the major aerospace companies who flippantly responded that the prospect of small private organizations building high altitude manned rocket vehicles was preposterous. Am I over-simplifying or is there some truth to this? Has overcoming the common perception of rocketry and spaceflight as impossibly difficult for all but governments and large companies been the main obstacle to raising funds for the prize? It looks like you turned that perception from an obstacle into an advantage. Diamandis: I'm not a liberty to provide any details about the workings of our insurance policy or how they reached their decision. It is, however, fair to say that the traditional aerospace industry might consider the X PRIZE flights non-trivial. They might also discount the ability of many of our teams to complete these flights. We need to remember that most innovations and breakthroughs come from small groups and from non-traditional solutions to problems. We're hopeful that this will happen at the X PRIZE as well. HS: I think that it's fair to say that sub-orbital flight has not been of tremendous interest to space activists - seemed boring compared to reaching orbit. For example, until the last couple of Space Access Society meetings, of the 6 or so that I've attended, there was little promotion of sub-orbital except by Pat Bahn (TGV Rockets) and maybe one or two others. Now in this post-Iridium-Apocalypse period, when no one can find money for orbital vehicles, sub-orbital is looking great, especially with surveys indicating a substantial market for sub-orbital space tourism. When you started the X PRIZE, was it a struggle to build support for sub-orbital flight when even many space enthusiasts were not very enthusiastic about it? Do you feel they are starting to see the light now? Diamandis: I'm proud of the fact that the X PRIZE put suborbital flight back on the map. Before our announcement in 1996, no one was thinking about this as a market or a useful technology. 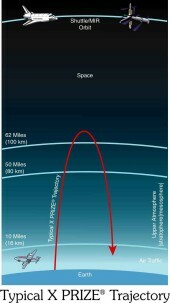 X PRIZE basically defined 100km and three people as a new class of launch capability. I believe people now fully get the idea that we need to start with a near-term achievable step that can generate a profit and then build from there instead of jumping straight to orbit. While orbital flight would be the ultimate goal of all space entrepreneurs, including myself, without major breakthroughs in technology, affordable orbital flight appears to be many years away. Suborbital flight technology, on the other hand, is achievable now, at a reasonable cost and will ignite the world's interest and enthusiasm for space. Recent, independently conducted studies also support the financial viability of suborbital companies and the large market for suborbital flight. The Futron study (October 2002) projects a $1 Billion market in ten years' time. HS: You often cite the aviation prizes in the early decades of the 1900s as the precedents for the X PRIZE. An additional connection to that period that I like to emphasize is that it was the time when modern rocketry was invented and developed by individuals like Goddard and Oberth and by private groups such as the various space and rocketry societies. Spaceflight really began then as a grass-roots phenomena with little involvement by governments. Later during the post-War period, everything got inverted by the huge missile and Moon Race programs. Instead of participants, we all became spectators to what government was doing in space. Now it appears with projects like the X PRIZE we are moving away from this top-down approach and getting back on track (after a ~65 year interruption!) with semi-amateur organizations and small companies developing rocket and space technologies again in a sustainable, bottoms-up approach - similar to the way PCs and most other technologies started small and gradually grew and blossomed. Do you think that space activists in general have wasted too much time and energy on promoting overly-ambitious projects, especially government funded ones, and should instead concentrate on a steady step-by-step approach? Do you think that with such an incremental approach, we can, in fact, eventually reach orbit, build space hotels, establish lunar colonies, etc., without relying primarily on large funding from governments? Diamandis: I am a space enthusiast and support space activities regardless of funding source, scale and size. I believe that providing spaceflight for the general public is not and is unlikely to be part of the mission of governmental space programs. The government's role is two-fold: research and development on one end of the spectrum, and exploration on the other end. So long as the government has the only ride into space, it will not be available for the rest of us to go. In addition, the government is unable to take the levels of risk that the private sector can take in developing, testing and implement new launch approaches. The analogy between the early room-size government computers and today's laptops is probably appropriate. The profit motive afforded by the future space-tourism market (in the short term) and the space-based resource market (in the long-term) will be the most critical driver to create a new generation of low-cost, safe spaceships. Eventually suborbital flights will lead to orbital flights, space hotels, colonization and beyond. HS: After the X PRIZE is won, there will be quite a letdown among all those groups that lost. Ideally, the winner and some of the runner-ups will continue with sub-orbital vehicle development for tourism and other potential markets. However, just as there were many aviation prizes, it could help the cause if there were other challenges and trophies to strive for. I just read today [Jan.20th, 2003] that you have been thinking about more competitions after the X PRIZE. Could you elaborate? Ed Wright has promoted rocket flights at air show exhibitions and even rocket races. Do you think such events could also help to keep the momentum going, especially if regulatory problems slow the development of sub-orbital tourism? Diamandis: The X PRIZE is only the beginning. While there will only be one winner of the X PRIZE Competition, the other runners-up are likely to continue to develop their ships to capture the public spaceflight market. The real long-term winners will be those who make profitable business from their designs. Once the X PRIZE is won, I hope that there will be a major flow of cash from the investment community into private space-related ventures. This was the case after Lindbergh's flight in which aviation stocks skyrocketed. We are now thinking about follow-on prizes. For example a trans-oceanic flight requirement that might yield a launch capability for same-day package delivery or same-day passenger travel. We also are looking at something called the X PRIZE Cup which is a follow-on fashioned after the America's Cup competition…only using spaceships. Perhaps the most important outcome will be the creation of a new marketplace that will help us drive technology. The year before Charles Lindbergh flew from New York to Paris, something on the order of 6,000 people flew in airplanes. The year after he made his historic flight, over 180,000 people took airplane rides. The market and the need for suborbital vehicles will grow significantly after the X PRIZE is won. We are working closely with our friends at the FAA and NASA on regulatory issues and strategies. I do not believe there will be showstoppers in that area. HS: Thanks very much, Peter. And best of luck to the X PRIZE competitors! Addendum: The questions above were submitted to Peter before the Columbia tragedy. In this essay for Space News - More Frequent Space Flights Needed - Feb.5, 2003 - Peter discussed how we can honor the legacy of the Columbia crew by recommitting ourselves to developing "low-cost, safe and accessible human spaceflight." Also, see the team statements - X PRIZE teams vow to continue the 'Conquest of Space' - Feb.6.03 and Israeli Rocket Team Enters Private Race To Space - Pledges To Continue Dream - Feb.5.03. HS: I recently participated in a campaign on Capitol Hill to inform Congressional staff about the development of the sub-orbital industry and its needs with respect to regulations and insurance. (See Jeff Foust's writeup [and mine]) I've worried that a sub-orbital tourism industry might be killed in the cradle by heavy regulations but in general I was quite heartened by the encouraging remarks from the FAA-AST and Commerce spokespersons at the breakfast meeting and the positive feedback from the staffpersons. How do you see the regulatory situation with respect to the US X Prize projects? Is the X Prize organization working directly with FAA to help to prevent potential roadblocks, e.g. it would be a shame if a group is ready to fly in the summer of 2004 but doesn't get its license till January 05! I assume the groups plan to fly with only one pilot and extra ballast to represent the 2 passengers. In this case they would be able to fly with an experimental aircraft license. With the release last August by AST of the Advisory Circular on RLV licensing, would you encourage teams to seek a license under that regime instead? Diamandis: "Good question. I tell people that the two greatest challenges of opening the public space flight market is (1) availability of investment capital and (2) regulatory issues. It has never been about the technology. I'm very pleased with the level of enthusiasm and support that Patricia Smith, the Associate Administrator of the FAA-AST has given the X PRIZE and the U.S. Teams. We require that all the teams abide by the rules and regulations of the country from which they launch. So if it is determined that within the U.S. a team needs FAA-AST approvals to launch, they will need a license. The biggest difficulty is what happens after the X PRIZE gets won. How do we start a viable Public Spaceflight Industry in which people can buy tickets. The cost of "certifying a spaceship" that would allow you to sell tickets will be very tricky. Today's new airplanes must undergo an elaborate "certification" process before they are allowed to carry fare-paying passengers or cargo. Certification typically involves performing more than 1000 test-flights in order to collect extensive operating statistics; the average cost of certifying a small business jet aircraft can run in excess of $100 million, or up to 10 times the cost of developing the initial prototype vehicle. The time taken for such certification commonly exceeds three years. If such large investments of time and money are to be required of the nascent space tourism industry, great difficulties would be caused that would seriously hinder the creation of any viable start-up space travel companies. The stated goal of the FAA is to achieve 100% safety record. This is a difficult and demanding objective and is the result of many decades of evolution of progressively safer and safer airline systems. Should this goal also be applied even to the earliest space tourism vehicles, the cost of certifying a human-rated space launch vehicle would become prohibitive - assuming that a certification process would ever be developed at all! The question arises: "How should the U.S. government facilitate the creation of a space tourism industry that does not need to meet the extremely strict standards that the FAA requires of mature aviation services?" Is it possible to devise a legal construct which could allow for would-be space tourists to accept some risk themselves? After all, if the aviation industry had been held to a safety requirement as demanding as today's during its formative years from 1910 - 1940, today's rich tapestry of aircraft designs and capabilities could never have developed. A promising answer to this question may be found by looking at another part of the U.S. government. There is another regulatory body which also has the job of protecting unsuspecting members of the general public from being deceived by people with specialized professional knowledge. This organization is the Securities Exchange Commission (SEC), which is intended to prevent unwitting members of the public from being taken in by companies operating various fundraising scams. As such the SEC requires companies making an Initial Public Offering (IPO) of shares to undergo a high degree of rigor in their disclosures and processes. The resulting cost to a company of making an IPO is very high. The SEC however does not want to stifle young companies trying to raise money from private sources. Consequently, in order to broaden the range of fund-raising options, the SEC has created a category of fundraising called "Regulation D" under which companies can raise funds from "Accredited Investors" with less burdensome conditions than apply to IPOs. Based upon the precedent of the SEC regulation I've proposed to Patti Smith that the Federal Aviation Administration allow a "Private Carriage Exemption" for travel aboard privately owned and operated spaceships - namely the creation of an "Accredited Passenger" category of person who will be exempted from certain FAA regulations that apply to scheduled aviation services. The underlying objective is the same - to allow well-qualified people to choose to undertake certain risks that are greater than those involved in flying on a scheduled airline flight, in return for a rare and exciting experience which the person values. In doing so they will be helping to establish a new industry that is expected to grow into the largest activity in space. You can also find an interview of Dr. Diamandis by David Livingston in the archives at The SpaceShow. Dr. Diamandis can be contacted at peter.diamandis@xprize.org.